Like any other artistic medium, most video games "borrow" content and ideas from other titles. That's how inspiration works. There's a line between inspiration and copyright infringement, though, and in 1987 Time Warp Productions jumped over that line (then into a warp pipe). 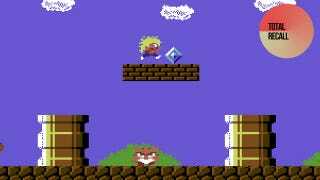 Their game, The Great Giana Sisters, wasn't a homage to Nintendo's Super Mario Bros. It was Super Mario Bros, with only a few token adjustments made to try and throw off Nintendo's notoriously dedicated legal team. Before the days of easy ports across gaming platforms, it wasn't common for titles to span both consoles and home computers. Both were built, from the ground-up, on different sets of hardware, meaning consoles excelled in some areas (like platformers) while computers were best for others (like flight sims). This meant entire genres went under-represented on both sets of hardware, and one which was sadly neglected on computers until the 1990's was the platformer. Sure, you could get your hands on games like Frantic Freddy or Montezuma's Revenge, but the kind of smooth-scrolling brilliance games like Super Mario Bros. featured just weren't available on systems like the Commodore 64, Amiga and early PCs (indeed that's a big reason id Software, who did find a way to get Mario running on a PC, first got their big break). That meant there was a hole in the home computer gaming market, and in the mid 80s, Time Warp Productions decided to fill it. Not by producing a unique, innovative platformer of their own, but by taking the core elements of Super Mario Bros., making a few token changes and passing the game off as their own (reportedly at the behest of their publishers, who wanted in on some of Mario's action). Which they called The Great Giana Sisters. In their defence, it's not like the game was a complete rip-off. While the world design, warp pipes, coins, power-ups and enemy behaviour (not to mention the concept of sibling main characters with Italian names) are lifted straight from the Mushroom Kingdom, TGGS had a great original soundtrack, controlled well and had some pretty challenging level design. A cheap shot at Mario & Luigi on the game's UK box art probably didn't help matters. Not that any of that mattered to Nintendo, of course. No sooner did the game hit shelves in Europe in 1987 than Nintendo threatened its publishers, Rainbow Arts, with legal action. While the exact nature of any settlement or agreement between the two publishers has never been made public, The Great Giana Sisters was instantly withdrawn from sale, and all further development on ports to other platforms (it was originally released on the Commodore 64, Amiga, Amstrad PC, MSX and Atari ST) cancelled. Because of the nature of the game's withdrawal (not to mention the fact it's a decent platformer in its own right), The Great Giana Sisters has become something of a cult hit over the years, gaining a fanbase through swapped/copied disks and even being the subject of some recent re-releases, including one for, of all systems, the Nintendo DS (albeit with re-worked graphics to cut back on the copyright infringement).